Back in 2011 when Acer released their first Acer HN274H B 3D monitor with 3D Vision 2 and 3D Lightboost technology support and I’ve got a unit for testing I have noticed that the monitor had some problems with the resolution in stereoscopic 3D mode. When it was showing something in stereo 3D mode the image was like with only half of the vertical lines per eye and not all of them showing, very similar to what you are seeing in a passive 3D monitor though there in 3D mode you get half the horizontal lines per eye. After all one of the advantages of active 3D technology is that it is supposed to be offering full 1080p resolution per eye thanks to the shutters in the 3D glasses being used. 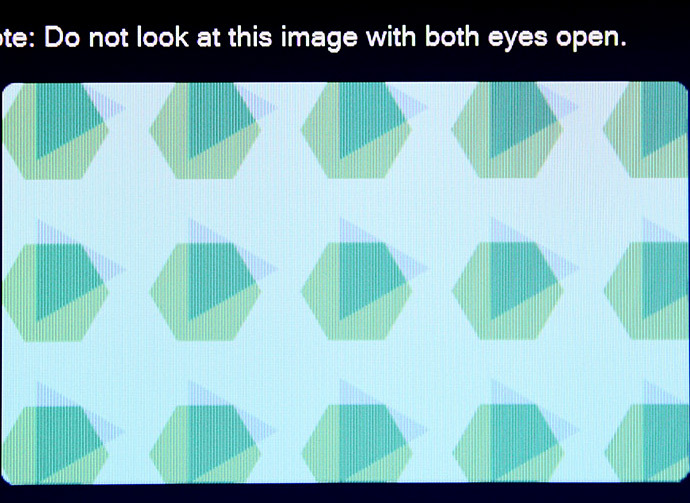 Notice on the image above how on the 3D Vision setup wizard with the screen showing the hexagon and rectangle stereo 3D test screen how the 2D text above is just fine, however the geometric figures with stereo 3D effect applied to them are like with half horizontal resolution – you see a line of green pixels for the hexagon then a line of what seems to be white pixels then again a line of green and the same goes with the blue for the triangle. Normally these figures need to be a solid color and monitors with this vertical scanline-like or checkerboard-like issue are showing them as if they are with lower resolution then they should actually be. Note that the image above is not a very closeup shot of the screen and yet the effect caused by the issue is clearly visible, so it is easily noticeable at normal viewing distance when using the display. Back then I’ve tried pretty much anything to see where the problem with the Acer HN274H B monitor not showing the full resolution per eye was, like using different video drivers, trying different GPU configurations, playing with different cables and so on, but nothing helped. So I ended up with the conclusion that there is something wrong with the monitor itself. Nvidia was also aware about the issue when I’ve checked with them and they were looking into what was causing the problem. I should note that when testing the Asus VG278H monitor that was the other 3D Lightboost-capable monitor back at that time there were no such problems as what the Acer monitor has shown in stereo 3D mode, so apparently not all monitors were affected by this. Since that time I’ve tested a few more newer 3D-capable monitor with 3D Lightboost technology and did not see the same problem present or that much apparent at least in any of them, however I just seen a forum post with people complaining of having very similar problem with most of the newer active 3D displays on the market though not all units seem to be affected. This includes monitors such as the Asus VG248QE, Asus VG278HE, Asus VG278HR, BenQ XL2420T and BenQ XL270T, so it seems that the problem is still there and the question is what is casing it? This issue has actually been identified as LCD inversion (alternating positive and negative voltages for pixels used within an LCD panel in order to prevent polarization and thus damage) and thanks to Mark Rejohn we already have a good online test to check your 3D monitor for LCD inversion artifacts, so check out the Moving Inversion Patterns Test. With that said, if you have a 3D-capable monitor that is suffering from the same problem as described above (seeming like half horizontal resolution) when in stereo 3D mode and by the way this issue is also visible with moving objects when you are using the display in 120Hz 3D mode, though everything seems normal in 60Hz, you are welcome to report it in the comments below or the forum topic linked below. Please post the model of your 3D display as well as a production date (should be printed on the information sticker at the back of the display). You can easily check to see if your 3D monitor is affected by the same issue and how strong the problem is by going through the 3D Vision setup wizard and taking a closer look at the Hardware Test image with the geometric figures that is on the photo above, so you actually don’t need anything special to test, though the mentioned test above can also help if you are using a compatible browser. Dammit, I thought there was something wrong with it. So I did not want to send it back because of the issue you describe here, as I did not even know that that is actually not supposed to be that way. Oh and I forgot the data, sry! It’s an Acer HN274HBbmiiid made in November 2011. This artifact is caused by LCD inversion. However, you get some disadvantage. The colors are slightly worse on the VG248QE, and the 3D Vision mode it has creates a lot less contrast and some purple tint, even though the image can be brighter. If you want good 3D Vision color *and* less checkerboard artifact, I recommend VG278H, which has less artifacts than both VG278HE and VG278HR. There are several reports, including hazmatm comparision (on Overclock.net) of VG278H and VG278HE. I have created new Blur Busters UFO Motion Tests to test for the inversion artifact on 3D Vision monitors. Also, view TestUFO links in Chrome or another 120Hz-friendly browser. (Internet Explorer doesn’t do 120Hz animations). I just tested my Acer HN274H BMIIID (the one without lightboost), and it doesn’t seem to have this issue. I can try to capture the pixels with my usb microscope later, if that would be helpful. Can this be done by anyone and does the kit work with asus VG278H? I have seen this on three different ASUS PG278Q without 3d mode. Just by scrolling in browser. PG278Q has this even in 2D mode. It is very clearly visible in 3D mode as well. I can see it on my Asus PG278Q but only in some 3D Games. I can see it when playing Tomb Raider or Watch_Dogs, but when playing CSGO, everything is OK.